A pair of entrepreneurs who put on face masks and protective clothing to make their fiery chilli jam are celebrating a major milestone - netting their 150th stockist. Dominic Haynes and Llyr Jones, who launched the Dangerous Food Company less than three years ago when they were both made redundant from an Irish dairy, are now supplying their unique brand of chilli jams to restaurants, farm shops and delicatessens across the UK – and even as far away as Alphen in Holland. They say an £2,300 grant from Denbighshire County Council has fuelled their rapid growth, including recent expansion into the luxury goats’ cheese market, and helped them to meet customer demand more readily through the purchase of a walk-in fridge. And as the St Asaph-based enterprise prepares to unveil a new, top-secret product ahead of the Hamper Llangollen food festival on October 15 and 16, the duo are have signed up their 150th outlet – the soon-to-be opened Frankie’s Farm Shop in Dyserth. “We are finally at the stage where we know it’s working,” said Dominic, 33, who lives in St Asaph. “We’ve done it all debt-free and it’s just grown and grown. There have been some initial dark days, like every business, but now everything is falling into place. It’s now all about expansion and doing things quicker. “In order for a business to grow you have to outlay money but if half the cost can be taken away it means you feel more confident and safer about expanding and you can grow more quickly and make the business more successful. “Already, with just the two of us on the ground, we’ve acquired a small part of the food market and we want to spread our products further and further afield. The duo, who’ve been friends for 11 years, started making fiery chilli chutneys suitable for meat, cheese and barbecues in January 2013, combining hot chillies with traditional British fruits to enhance the flavour. Dominic, who graduated from Nottingham University with a degree in product design, was renowned for his culinary skills among friends and family and created no fewer than 38 versions of what is now the firm’s original product, Red Chilli and Lime Jam, in his home kitchen before deciding on his final ‘wow factor’ recipe. “I’ve always been pretty good in the kitchen. Everybody knew me for cooking really spicy food at uni and used to complain about the smell,” he said. In the early days, the friends decided to sell some of the jam at a weekend food event and were stunned when all 600 jars flew off the stall. The very next day, the pair found out they were being made redundant from their sales jobs which gave them the incentive to sell the jams full-time. By May 2014, the businessmen had developed three jam products; their original Red Chilli and Lime Jam, Habanero Chilli with Sun-ripened Mango Jam, which scooped two stars in the Great Taste Awards in 2015, and Jalapeno Chilli and Apple Jam, and had moved production out of Dominic’s modest home kitchen to premises at Patchwork Pate in Ruthin. 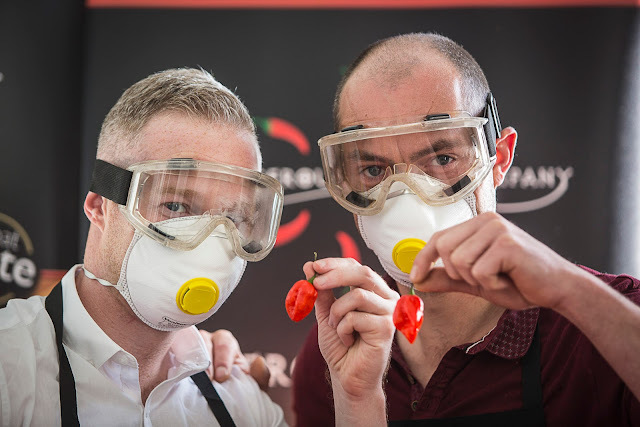 More flavours followed including the fiery Ghost Chilli Jam containing one of the world’s hottest chillies and requiring protective eye gear during production. In August last year, they branched out and sourced a luxurious goats’ cheese product from Holland to offer under their brand which has been well-received in the gourmet food market – and has led to a coveted stockist contract across the Channel for their jams. And thanks to a business grant provided by Denbighshire County Council at the start of 2016, they were able to purchase a purpose-built outdoor storage facility which enabled them to quadruple their order capacity and expand. “We’d taken on some big wholesalers and the fridge meant we were able to store the products with ease,” said Dominic, who attended Blessed Edward Jones Catholic High School in Rhyl while growing up. “The grant made our growth manageable and easier. For any business like ours, January and February is quiet and to outlay that kind of money ourselves would have carried much more risk. Kirsty Davies, Business Support and Networking Officer for Denbighshire County Council, said: “It’s incredibly rewarding to watch local businesses succeed, especially so soon after launching. "Our business grant scheme is designed to encourage new businesses to take those first steps towards expansion and ultimately create new jobs and support development of the local economy, which is a council priority. “Many small businesses face hurdles on the path to growth including a lack of resources or facilities and this project helps to mitigate some of these, allowing innovation and talent to flourish uninhibited." It was a sentiment echoed by Hugh Evans OBE Leader of Denbighshire County Council. He said: "The business grants are part of our Economic and Community Ambition Strategy which is helping towards creating flourishing private businesses, job growth and improved incomes in the county." The Dangerous Food Company exhibits their products at food festivals every weekend and is committed to supporting local, independently-run small businesses. As well as employing themselves, one other full-time member of staff and a new part-time worker, in addition to agency support when required, the company now has six jam products to its name – and one more in development which will be launched to coincide with Hamper Llangollen food festival. Dominic is remaining tight-lipped on the secret ingredients but promises the product will be ‘something that has not been tried before’. “We try and make our products all about flavour and the fruit really plays off the heat. We want our customers to taste the flavours,” said Dominic. “We’re looking forward to going back and meeting all our oldest customers at Hamper Llangollen. To find out how to apply for a Business Development Grant go to Denbighshire.gov.uk/business or call 01824 706896.